By the 3rd millennium BCE, the southern Levant was a land of small, fortified towns and villages, ruled over by petty kings and chiefs. Indeed, by this time, most modern towns in the area had come into existence. A major trade route connecting Mesopotamia with Egypt (later known as the King’s Highway) ran south from Damascus through the Jordan valley. 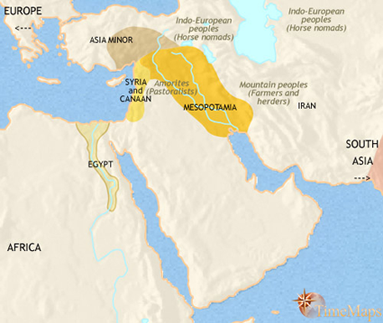 Urbanism, along with Bronze Age technology, had presumably arrived in this region via trade links with Mesopotamia. In any event, urban civilization began to flourish here not long after it had begun in Egypt. Nomadism had also made its appearance, with pastoralist clans grazing their sheep on the eastern hill country and in the grasslands between the settled areas. In the later 3rd millennium, the towns of Canaan declined, many vanishing altogether. Pastoral nomadism became the dominant economy. This was at around the same time as the Amorites were moving into northern Syria, and it may well be that their close relatives, the Canaanites, who were either newcomers to the area or who had already lived in the eastern highlands for centuries, now expanded westward to the coast. Some indeed probably migrated further, bringing the Nile Delta in northern Egypt under their control. They appear in Egyptian history as the “Hyksos”. In time, urban settlements reappeared amongst the Canaanites, and numerous small kingdoms. These fell under the dominance of Egypt during the early 2nd millennium BCE. Sometime during this period the Canaanites developed a proto-alphabetic script. This may well have occured as a result of Egyptian cultural influences, with the Canaanites using Egyptian-style heiroglyphs to represent consonants. Only a few examples of this early script have been found, and it was probably not in common use. However, in centuries to come it would be taken over by the Phoenicians, refined and passed on to many other peoples. This early Canaanite script was thus the ancestor of all alphabets in the world today. Egyptian power in Canaan was later contested as major states arose in northern Syria: first the Mitanni and then the Hittites. However, the dynamic pharaohs of New Kingdom Egypt successfully asserted their dominance in the area. Thereafter, apart from launching punitive campaigns from time to time to keep the petty Canaanite kings in line, the Egyptians adopted an “indirect rule” policy, using (semi-)loyal chiefs of tribes and rulers of city-states to protect their interests. The Armarna letters, a royal archive of Egypt containing over 350 diplomatic letters between the Egyptian king and foreign rulers, make clear that, to the many petty chiefs and kings of Canaan, the Pharaoh of Egypt was their overlord. These small states were constantly quarrelling amongst themselves, appealing to their Egyptian government to settled their disputes. Egypt lost its dominating position in Canaan as general disorder overtook the Middle East in the later 2nd millennium BCE. The Canaanite city-states on the coast were subject to destructive attacks from the Sea Peoples, who had previously devastated the coasts of Asia Minor and other eastern Mediterranean. The northern Canaanite seaboard cities, for example Byblos, Tyre and Sidon, survived these attacks, and were soon flourished as never before as dynamic centres of maritime trade. These cities became known to history as the Phoenicians. To their south, however, the Canaanite cities were destroyed, allowing one group of the Sea Peoples to settle the area. These were the Philistines, and their five coastal cities, Gaza, Ashkelon, Ashkelon, Ekron and Gath, were to form a formidable confederacy in the area. The Philistines were the people in this part of the world with whom the Greeks and other Mediterranean peoples were most familiar. As a result, the whole of what had previously been Canaan became known as the land of the Philistines, or “Palestine”. In the eastern hill country, a group of other peoples closely related to the Canaanites had by now established themselves. These were (from north to south) the Ammonites, Moabites, and Edomites. A fourth group, just to the west, were also establishing themselves in the eastern hill country. Closely related to the other groups, they had quite distinct cultural practices. One striking aspect of the archaeological record is their lack of pork remains, in marked contrast with finds from other parts of Palestine; and there are also indications that circumcision was being practised. Clearly, here was a population practising at least some elements of the later Israelite religious culture. Some modern scholars regard the monotheistic religion of the Israelites as having evolved gradually out of the beliefs and practices of the earlier peoples of Canaan. The fact that the Israelites were not strangers to the area is clear from their Hebrew language, which is a Canaanite dialect. However, the Israelites’ own records, which are found in today’s Jewish and Christian scriptures, point to an entirely external source for their highly distinctive religious faith. Given the radical gulf between Israelite practices (for example, circumcision and prohibitions against eating pork, sexualized worship and the sacrifice of babies), and those of other peoples of the area, it is hard not to give the Israelite account serious credence. As time went by, and over a period of centuries, Israelite culture gradually spread from the eastern hill country into the coastal plains, as their population expanded. From then on, over a period of hundreds of years until the 6th century BCE, the Canaanites were progressively absorbed by the Israelites. This process of absorption had religious and cultural ramifications, and the Biblical records point to the continuing influence of the Canaanite polytheistic cults over several centuries. The tensions this created helped give rise to a major element within Israelite religious culture. This was the prophetic tradition, whereby religious figures called prophets continually called their people back to the worship of Yahweh alone. The Israelite’s own records suggest that until the end of the 1st millennium BCE they were dividd into a number of tribes which formed a loose confederacy. Military and religious leaders, known in the Bible as “judges”, appeared from time to time, recognized by more than one tribe, and in some cases perhaps by all of them, to deal with particular threats. These threats of course came from the other peoples of the region. The Israelites were caught between, on the one hand, the Philistine city-states on the coastal plain, and on the other, the kingdoms of Edom, Moab and Ammon in the eastern hill country. According to the Bible, it was to deal more effectively with these peoples that the Israelites adopted a more centralised form of state structure when they transformed their tribal confederacy into a monarchy. The Bible records that the first king was Saul. He struggled to unite the tribes under his rule, and failing in this, was replaced (traditionally in 1007) by a new king, David. David captured the Canaanite city-state of Jebus, and renamed it Jerusalem (“City of Peace”). He established it as his capital, and from there was able to unite the kingdom of Israel more firmly under his rule. David then expanded the Israelite kingdom’s borders by bringing neighbouring peoples, the Philistine cities and the kingdoms of Edom, Moab and Ammon, under his rule. He later pushed Israel’s borders northward to the Euphrates river by conquering the Aramaeans of Syria. David’s son Solomon (c.965-928) centralised the worship of Yahweh in the new Temple he built in Jerusalem. He forged close alliances with powerful states such as the wealthy Phoenician city-state of Tyre. His foreign policy centred around the expansion of trade, and he is even said to have received a visit from the queen of the distant kingdom of Saba (“Sheba”), in southern Arabia. Within the span of two generations, therefore, the Israelites had become a significant regional power. Probably at about this time, the Israelites adopted a version of the Phoenician alphabet for their own use; this was ancestral to the modern Hebrew script. A centralised, unified state did not sit easily with the several Israelite tribes, however. After Solomon’s time, most of the Israelite tribes threw off their allegiance to the royal family in Jerusalem. Only the southern tribes of Judah and Benjamin rallied behind David’s descendants and formed the smaller kingdom of Judah, with Jerusalem as its capital. The bulk of the tribes continued the kingdom of Israel under a different line of kings, and with a different capital, Samaria. The family of David continued to reign in Judah until the end of its existence as an independent state; the northern the Kingdom of Israel experienced much greater political instability, under a succession of short-lived dynasties. Archaeological evidence shows that the first centuries of the 1st millennium BCE were times of prosperity for the region. Some modern scholars have ascribed this to an unusually benign period of climate. Whatever the cause, the growing wealth seems to have led (as is often the case) to a yawning gap between rich and poor, which, the kingdom of Israel in particular, may be reflected in the strident condemnation of the inequality in society by the Israelite prophets. The people of both Israel and Judah continued to worship the one God, but, especially in the northern kingdom, this monotheistic faith came increasingly under pressure from the polytheistic religions of the region. In reaction to this, prophets in both kingdoms called on the people and their rulers to remain faithful to their monotheistic faith. In so doing they developed a teaching which emphasised that the worship of God was inextricably intertwined with treating fellow human beings – especially the weaker members of society such as the poor, widows, orphans and foreigners – with justice and mercy. This kind of moral behaviour was emphasised to a degree never before recorded in human thought. The northern kingdom of Israel starts appearing in non-Biblical records from at least by the second half of the 10th century, the southern kingdom of Judah somewhat later, from the mid-8th century onwards. The division of Israel into two kingdoms weakened them both. The Aramaeans quickly broke away from Israelite dominance, and their kingdom based on Damascus soon became one of Israel’s most powerful enemies. The Philistine city-states and the kingdoms of Edom, Moab and Ammon also regained their independence. From the mid-8th century all the kingdoms of the region came under increasing threat from the expanding Assyrian empire. This culminated in the later 8th century: first the kingdom of Damascus, in 732, then the kingdom of Israel, in 722, were extinguished by the Assyrians. Their capitals were destroyed, and both Biblical and Assyrian sources speak of massive deportations of people from Damascus and Israel. Replacement settlers were brought in from other parts of the empire. Such population exchanges were an integral part of Assyrian imperial policy, as a way of breaking old centres of power. 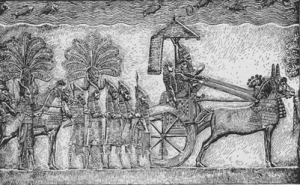 According to an Assyrian inscription, the number of Israelites transported from their homeland amounted to just over 27,000. Even taking into account a large-scale emigration to the southern kingdom, the majority of the population were still presumably left in place. However, groups from other parts of the Assyrian empire were settled in the area by the Assyrian authorities. These apparently soon adopted the Israelite worship of Yahweh, perhaps modified in some details. They intermarried with the native inhabitants and became the ancestors of the Samaritans. The territory of the old kingdom of Israel became the Assyrian province of Samaria. It seems to have been under a line of governors drawn from local families. The other states of the area – the Philistine city-states and the kingdoms of Judah, Edom, Moab and Ammon – escaped the fate of Israel by becoming tributary states of Assyria. The Assyrian records show that these kingdoms were sometimes loyal, sometimes disloyal, to their Assyrian overlords. All these kingdoms rebelled against Assyria in about 701 BCE, but the anti-Assyrian alliance soon seems to have fallen apart in the face of a massive invasion by the Assyrian army under king Sennacherib. Most of the kingdoms hurriedly resumed their submission to Assyria, but Judah was slower to do so, and the Assyrians lay siege to Jerusalem. Judah survived the assault (miraculously, according to the Bible, but not without large-scale destruction round about, as the archaeological evidence shows). After this, the kings of Judah became vassals of the Assyrian king again, and were left in peace. The destruction of the kingdom of Israel had a deep impact on the kingdom of Judah. A stream of refugees from Israel flooded into the kingdom, boosting its population. In the 7th century, Jerusalem expanded dramatically. However, Judah was now the only Israelite kingdom left, surrounded entirely by pagan peoples. Perhaps because of this, the rulers of Judah tended to emphasise the worship of Yahweh as a central part of their political programme. A state-sponsored religious reform movement culminated in the reign of king Josiah (reigned 641-609 BCE), which centred the religious life of Judah much more firmly on the Temple in Jerusalem, and called for a greater degree of obedience from the people to the faith’s teachings. By this time, however, large-scale geopolitical developments were reshaping the political situation in the whole of the Middle East. The central event in this was the sudden collapse of Assyrian power in the decades after the 630s, in the face of multiple revolts by its subject peoples. For a brief period, the kingdom of Judah benefited from the resulting vacuum of power in the Middle East by expanding its own borders to take in much of the old territory of Israel. 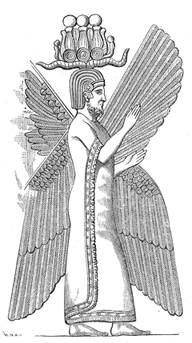 However, a new regional superpower rapidly emerged, that of Nebuchadnezzar, king of Babylon. The struggle between the Babylonian empire and a resurgent Egypt for control of Syria and Palestine led, as a by-product, to the conquest of all the kingdoms of Palestine by Nebuchadnezzar in a series of campaigns between 597 and 582. Under the Babylonians, most Palestinian rulers remained in place, now as vassals of the king of Babylon. The exception was Judah, which, thanks to its repeated resistance to the Babylonians, experienced catastrophe. The kingdom was extinguished; its political and religious elite were taken off to exile in Babylon; the Temple in Jerusalem was destroyed, and much of the city with it; and the territory of the former kingdom, shorn of outlying districts (hived off to neighbouring kingdoms), was turned into the province of Judea, under governors appointed by the Babylonians. Jerusalem was stripped of any administrative status, with the town of Mizpah, to the north, being made the provincial capital. Only a minority of the population were taken into exile in Babylon. Thousands more emigrated to Egypt, and from this time on communities of Jews began appearing in cities throughout the Middle East and beyond. For those who remained in Judea, life was tough. The violent cycle of Jewish rebellion and Babylonian counter-measures had devastated many towns and villages, and had led to a significant drop in population and prosperity. The towns and cities of Judah were now unwalled by Babylonian decree, and this made them vulnerable to attack from neighbours. The peoples of Edom, Moab and Ammon, themselves under pressure from Arab tribes migrating in from the eastern desert, settled territories previously belonging to the old kingdom of Judah. With Judah’s religious, intellectual and political leaders now far away in Babylon, the major Jewish cultural developments of the period took place in this foreign city. Here, the leaders of the Jews (for that is now what we can properly call the people of Judah) had to come to terms with an immense trauma. The loss of their political independence was nothing compared to the challenge to their dearly-held beliefs. Rather than let go of these, the Jews interpreted this catastrophe in the light of their faith. The fall of Judah came to be seen as divine punishment for the failure of the Israelite rulers and people to worship Yahweh to the exclusion of all other gods. The previous, widely-held, assumption that the God of Israel would protect his chosen people and David’s royal line for ever and under all circumstances, was drastically redefined so that the Jews began to look forward to a Messiah, a son of David, who would deliver the people and Jerusalem once and for all time from foreign oppression. The exiles embarked on the process of collecting and editing many of their writings and oral traditions, and it was at this time that the Jewish Bible (the Christian Old Testament) began to take shape. Large sections of the prophetical books were written at this time, with their hallmark being an increased emphasis on individual responsibility before God, and on personal morality and holiness. With the conquest of the Babylonian empire by Cyrus the Great, king of the Persians (in 539 BCE), Palestine passed from Babylonian to Persian control. The various native dynasties of the region remained in place, now as vassals of the Persians, but the province of Judea experienced significant change. According to the Bible, one of Cyrus’ first acts was to require the Jewish exiles in Babylon to return to Jerusalem and rebuild their Temple. Judea was granted a large measure of self-rule, under the leadership of the Temple priesthood. A line of hereditary high priests acted as the Persian king’s governors of the satrapy of Syria. The new situation was not at all to the liking of other elites within Palestine. The leaders of the provinces of Samaria, Ammon and probably others unsuccessfully opposed the attempts of the exiles to rebuild the Temple. The Samaritans, who lived in and around Samaria (the former capital of the long-defunct kingdom of Israel) had reason to feel threatened by the returning exiles. The Samaritans followed a hybridized version of the Jewish religion, and because of this and their mixed ancestry, were not regarded as true Israelites by the returning Jews. For their part, the return of exiles who claimed to follow the pure Jewish faith represented a denigration of their own beliefs and practices. The Samaritans built their own temple to Yahweh at the town of Nablus, near Mt Gerizim, and the resulting hostility between the two groups would last for many centuries. The territories of Israel’s historic neighbours the Edomites, Moabites and Ammonites were under intensifying pressure from Arab tribes, who were coming into the eastern hill country with their flocks. It is likely that the older populations were either absorbed into these incoming clans, or migrated westward to be absorbed into the Jewish population. Moab and Ammon now disappear from the historical record, while the Edomites shifted westwards, into territory that had traditionally belonged to the Israelites. The Philistine city-states on the coast retained their identity and autonomy under Persian rule. Their Philistine identity had long since been submerged into the wider Aramaic culture of the region. Within Judea itself, there is evidence of tensions between the returning exiles and the majority population. These seem to have been resolved in the course of several generations as the Jewish leaders successfully drew the majority back into the worship of Yahweh, centred on the Jerusalem Temple. It was during this post-exile period that the Jewish scriptures began to take their final form. At the same time, however, the old Hebrew language was falling out of use for everyday life, being replaced by the lingua franca of the Middle East, Aramaic (Hebrew continued to be used by the Temple elite for religious purposes). The Persian empire was conquered by Alexander the Great in the 330 and 320s BCE. On Alexander’s death, his generals fought each other for control of portions of the empire, with Judea changing hands between them on numerous occasions in the space of just a few years. When comparative peace returned to the region, by around 300 BCE, Judea and its neighbours were under the control of Ptolemy, the ruler of Egypt. However, the Seleucids of Syria gained control of the region in 198. There is very little evidence for how the localities were administered in Seleucid Palestine. However, it is likely that the Seleucids would have followed the Greek model and, for purposes of local government, divided most of the region amongst city-states. These would have had a large measure of self-rule under city councils composed of members of the local elites. The councils would have governed their cities along with a large area of countryside around them. The old Philistine cities, now under Greek-style city councils, became centres of Hellenistic civilization. Inland, Hellenism was confined to some elements within the urban elites. The countryside remained largely Aramaic in language and culture. The main exception to this was the area which came to be known as the “Decapolis”. Here, ten cities, a few being ancient towns which had been Hellenised, but most newly-founded colonies with Greek (or Greek-speaking) populations, formed a bloc of territory on the east side of the river Jordan. The Hellenistic culture which they shared was in marked contrast to the traditional culture of the native population. Initially, the Jews were left in peace by the Hellenistic rulers, and the district of Judea remained under the Temple priesthood. 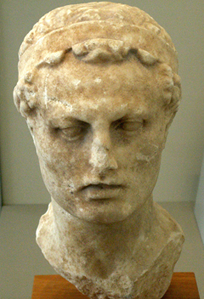 However, the Seleucid king Antiochus IV Epiphanes (174–163 BCE) tried to impose Hellenistic culture – including the Greek pagan religion – on them. He sacked Jerusalem, plundered the Temple, outlawed the worship of Yahweh in the Temple and set up a statue of the Greek high god Zeus near it. His actions of course inflamed the Jews, who rose in rebellion against the Seleucid regime (167). After a fierce struggle lasting more than 10 years, and assisted by rivalries within the Seleucid royal family, the rebels succeeded in gaining control of the province. Their leaders, the Maccabbees family, became the high priests in Jerusalem, and returned the Temple to Jewish worship. They governed the province under only loose supervision from the Seleucids. Little by little, taking advantage of repeated civil wars within the Seleucid kingdom, the Maccabbees (or Hasmoneans, as they were also called), established the Jewish territory as a fully independent state, with themselves as its kings. By this time, Seleucid power was in general decline throughout the whole of Syria, as constant civil wars destabilized the kingdom. In this situation, the Hasmonean kings expanded their borders drastically, annexing the neighbouring territories of Transjordan (including the ten Hellenized cities of the Decapolis), Samaria, Galilee and Edom (now called Idumaea). By the end of the 2nd century BCE, therefore, the Jewish state had regained something like the borders of ancient Israel at its height, under kings David and Solomon. None of these areas had been part of a Jewish (or Israelite) state for hundreds of years. It seems that in some of the newly-annexed territories, the Jewish authorities gave their populations, or perhaps their ruling classes, a choice: convert to Judaism, or leave. This certainly happened in Idumaea. Some of the newly-Jewish families clearly prospered under their new masters: a generation later, an Idumaean called Antipater gained control of the Jewish state. It is also likely that the conquests were followed by a colonization of some districts by Jews. Galillee seems to have been very sparsely inhabited for centuries, and archaeological evidence points to a marked increase in population from this time on. By the 1st century the region was overwhelmingly Jewish. The Samaritans, already (in their own lights at least) adherents of the Jewish religion, remained as a distinct population after this time. Their temple, however, was destroyed by the Jews. The people of the Decapolis seem to have been allowed to follow their Hellinized way of life. Despite the mass conversion to Judaism, and the Jewish immigration into Galilee and perhaps other territories, the newly added districts were regarded as somewhat “beyond the pale” by the Jews of Jerusalem and Judea. Their inhabitants were looked down on as not full Jews, their impure status betrayed by distinctive provincial accents. On the wider stage, a new power was increasingly making its presence felt in the region: Rome. The Hasmonean kingdom had been able to establish its independence partly through Rome’s friendship. Finally, in 63 BCE, a Roman army under the famous general, Pompey the Great, having first extinguished what remained of the Seleucid kingdom, marched into Judea. 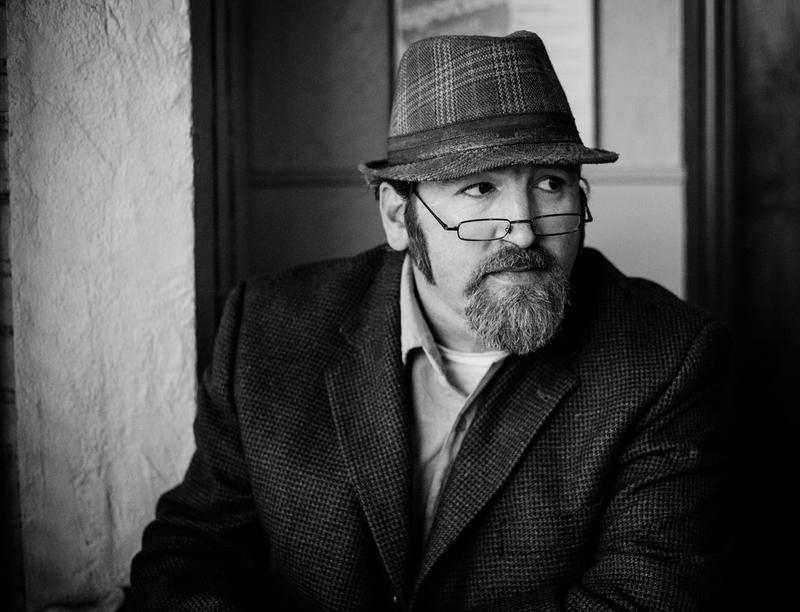 Pompey left the local political arrangements he found in Palestine in place. One exception was that he liberated the ten Hellenized cities of the Decapolis from Jewish rule, restoring to them their own self-government. Within Judea, Pompey installed a member of the Hasmonean family, called Hyrcanus, as ruler. One of Hyrcanus’ high officials was Antipater the Idumaean. Whilst pushing the frontiers of their empire ever outwards, the Romans were also involved in their own repeated bouts of civil war during this period. The impact of these was soon felt in Judea – an impact intensified by the fact that the Jewish royal court was split into bitter rival factions. Violent struggles repeatedly rocked the state. Antipater was a master operator in this situation. Facing down Hyrcanus’ enemies, he manoeuvred himself into dominating the ruler. Antipater became a close friend of Pompey’s; and with Pompey’s backing, Antipater was soon the effective master of Judea. In 47 BCE, however, Pompey was defeated and killed by a rival Roman general, Julius Caesar. Antipater swiftly switched his allegiance to Caesar, and led troops to Caesar’s aid, helping him to establish his power in the region. For this, Caesar made Antipater a Roman citizen and appointed him governor of Judea. The wheel of fortune turned, and Antipater was assassinated by a rival in 43 BCE and a coup brought his enemies to power in Judea. Judea’s new rulers were also hostile to Rome, and invited the Parthians, Rome’s great enemies, to occupy Judea. Antipater’s son, Herod, thereupon hurried to Rome, and persuaded the senate that he was the man they needed to be in charge of Judea – he would be loyal to Rome and further its interests in this unsettled region. The senate therefore appointed Herod King of the Jews. It took the Romans – supported by troops raised and led by Herod – three years of hard fighting to re-gain control of Judea. When they had done so they installed Herod as king. Herod reigned over Judea until his death in 4 BCE. In doing so, he had to navigate the treacherous power politics back in Rome. He was at first a supporter to Julius Caesar’s old lieutenant, Mark Antony, the Roman commander in the East for many years. When Antony was defeated and killed in a civil war with his rival, Octavian, Herod had to win over the new master of the Roman world. This he accomplished with great aplomb. He soon had the confidence of Octavian (who would soon take the name Augustus and become the first of the Roman emperors). Herod ruled Judea for 37 years. He taxed the people heavily, but he used his loyalty to the Romans to keep them at arm’s length. He enlarged and beautified the Temple in Jerusalem, making it a magnificent centre of the Jewish religion. Many Jews, however, refused to recognize him as their legitimate king. He had sought to bolster his standing with the Jews by marrying a princess of the old Hasmonean royal family, but, in the last resort, he owed his throne to foreigners. He was not even regarded as a proper Jew. His family were from Idumaea, and were recent converts to Judaism. 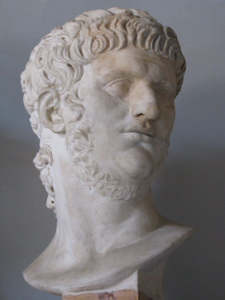 In his personal life, his religious observances were fitful; he lived the life of a Graeco-Roman aristocrat rather than a pious Jew, and his hedonistic ways affronted his stricter subjects. In his official policies he also championed Hellenization, at least in some areas. he adoptd the ancient city of Samaria as his capital and turned it into the Hellenistic city of Sebaste (which is Greek for Augusta), and its port was the new Hellenistic-style city of Caesaria Philippi. After Herod the Great’s death in 4 BCE, his kingdom was divided amongst his three sons. Ten years later, however, the largest of these kingdoms was made into the Roman province of Judea. In 41 CE, Herod’s grandson, Herod Agrippa, having inherited the remaining Herodian kingdoms, was given the Roman province as well. The old kingdom of Herod the Great was thus reconstituted. Herod Agrippa died just three years later (44 CE). The Romans resumed direct control of most of his territories, with only a small area in the north going to the last of Herod’s line, Herod Agrippa II. On his death in CE 92 his kingdom too was incorporated into the Roman province. By this time, a new religion was spreading outwards from Judea. From neither Biblical and extra-Biblical records (for example, the histories of the Jewish historian Josephus), is it easy to gauge exactly how widely the activities of Jesus of Nazareth and his disciples affected the populations of Judea and the surrounding territories. Political agitators seem to have made more of an impact amongst contemporaries. However, after Jesus’ execution by the Romans, his small band of followers claimed to have seen him alive again three days later, appearing to them on several occasions for about a month. These followers saw Jesus as the “Messiah”, long anticipated by the Jews; however, his aim was to change hearts rather than rule states. His disciples were soon travelling the known world to spread their faith. The new religion of Christianity, which Jesus’ followers founded and which gradually began to differentiate itself from traditional Judaism, had reached as far as the imperial capital within a few years, and within a generation of Jesus’ execution, Christianity had become prominent enough to attract a wave of persecution under the emperor Nero. In Judea itself, the Romans had encountered continual trouble in governing the province. A particular source of tension was the arrival of large numbers of Greek-speaking settlers from other parts of the empire and the consequent spread of Hellenistic culture in the area. Trouble between Jews and Hellenists was never very far away. This situation was more or less contained (albeit with the outbreak of a couple of localised rebellions, soon put down) for many years; however, with the appointment of a Roman governor who had complete disregard for Jewish religious feelings, a fierce revolt flared up, in 66 AD. This soon engulfing the entire province, and became a major challenge to Rome’s hold on its eastern frontiers. The Roman army had to commit large numbers of troops to stamping it out. It was finally defeated in CE 73, by which time much of Jerusalem and almost the entire Temple, the centre and focus of the Jewish faith, lay in ruins. The Samaritan community, which had not participated in the revolt, suffered in the aftermath: a new Hellenistic colony, Neopolis (modern Noblus) was founded at their traditional religious centre of Mt Gerazim, as a boost to the Greek-speaking population in the area. In 133, a second great Jewish revolt broke out, led by a charismatic leader called Simon Bar Kochba. This was sparked by the emperor Hadrian’s plan to establish a Roman colony on the old site of Jerusalem. The revolt involved bloodshed on a massive scale as the Romans systematically reimposed their authority (which they had achieved by 136). After this, the Jews were banned from living in in or near Jerusalem. Jerusalem itself was rebuilt as a Roman colony. Even the name “Judea” disappeared as a Roman administrative label, with the province now being called Syria Palaestina. The Roman attempt to keep the Jews out of their old homeland after the Bar Kochba revolt had never been wholly successful, and small Jewish communities gradually reappeared (if they had ever gone away). Indeed, their existence was recognized by the granting of certain privileges, such as exemption from the imperial cult and internal self-administration. Also, it was not long before they were granted the right to visit Jerusalem (Aelia Capitolina) on certain feast days. In any case, the areas surrounding Judea, especially Galilee, had not been subject the ban, and the Jewish population had remained there unmolested; and Samaria remained home to the Samaritan community. In the mid-3rd century, Palestine was caught up in the disasters which beset the Roman frontier at that time. For several years, in the 260s and early 270s, the province was under the control of the separatist regime of Zenobia, Queen of Palmyra, until restored to the empire by the emperor Aurelian in 272. With the coming of Christian emperors to the throne after 324, Palestine’s status was transformed. As the location for the life and mission of Jesus of Nazareth, and the place where Christianity started, it began to receive lavish attention from the imperial family. Many fine churches were built. Aelia Capitolina came again to be called Jerusalem, and its bishop became one of the four or five most senior bishops – or patriarchs – of the Christian Church. Many of the earliest Christian monasteries outside Egypt were founded in Palestine, which became a major centre of Christian scholarship. The area naturally attracted many Christian pilgrims. This contributed to the prosperity which Palestine experienced in the Later Roman Empire. Towns and cities thrived, farmland was extended by irrigation projects, and the population expanded. In 351-2 the Jews of Galilee engaged in a short-lived revolt against the Roman authorities. This seems not to have affected their status in the long term, and in 438 Jews were allowed to return to live in Jerusalem itself. The Samaritans were not so fortunate. In the late 5th century they came under official pressure to convert to Christianity, which sparked a series of revolts and the inevitable reprisals.